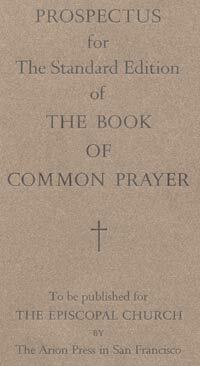 Books of Common Prayer in the U. S. Episcopal Church have always had "Standard Editions". The puorpose of these is to allow the Church and each Diocese to ensure that all copies of the Book of Common Prayer are indeed true and correct. The first of these was printed in 1793, and was followed by several others of the 1789 edition of the Book of Common Prayer, as small changes and corrections were made at successive General Conventions. For the 1892 Edition, however, a very large and elaborate Standard Book was prepared, and sold in a limited edition to subscribers only, in order to fund other copies used for the Standard Book's traditional purpose. This pattern was repeated in 1928, with again a large, finely made edition sold to subscribers only. Both of these were printed by Daniel Berkeley Updike, one of the foremost printers of the day, and these two Standard Editions (particularly the 1928 printing) can be numbered among the classics of American book publishing. So, when the 1979 Revision was approved, it was an obvious choice to repeat this pattern and authorize a high-quality printing of the Book of Common Prayer to be sold in limited quantities to subscribers. Andrew Hoyem and his Arion Press of San Francisco was chosen for this task and they drew up a prospectus, the cover of which may be seen at right. The prospectus called for a book of folio size (13.5" x 9", or 34 x 22.5cm) printed in 16pt Romulus type with red rubrics. It was to have the same pagination as the current 1979 Book, but somewhat different typography. However, for one reason or another, the project was never completed, a Standard Book never printed, and so all we have is the Prospectus. The Prospectus itself is 15 pages in length, and consists of an authorization by the Custodian of the Book of Common Prayer, a review of previous Prayer Books, a description of the proposed Standard Book, a typeface specimen, and four sample pages. We have the entire Prospectus available as PDF graphics - see the link at right.